Visiting County Kilkenny? This part of the Irish Province of Leinster has a number of attractions you will not want to miss. Plus some interesting sights that are slightly off the beaten path. So why not take your time and spend a day or two in Kilkenny when visiting Ireland? Here are some ideas to make it worth your while. The Irish name for County Kilkenny is Contae Cill Chainnigh, literally referring to the "Church of Kenneth" (today known as "Saint Canice's Cathedral"). The letters on local number plates are KK - following the Irish car registration system (first and last letter) the should be KY, but that was already taken by County Kerry (which comes first in alphabetical order). The county town is Kilkenny, with both Callan and Castlecomer being other towns of local importance. Sizewise, County Kilkenny weighs in at 2,062 square kilometers. A misleading nickname is in use for both town and county, referencing them as the "Marble City" and "Marble County" respectively. The local building stone is commonly known as "Kilkenny Marble", even though it is not marble - but a finely grained carboniferous limestone, polished and glistening when wet (which tends to be quite often). In GAA circles, players from Kilkenny are also known as "Noresiders" (from the naks of the river Nore) or "Cats" – the latter nickname going back to the legendary Kilkenny Cats and their fighting spirit. Saint Canice's Cathedral - the Real "Kilkenny"
Saint Canice's Cathedral in Kilkenny is rated amongst the finest churches in Ireland and serves as a fitting reminder of the middle ages. It also gave the name to the town and the county. "Kilkenny" means nothing less than the church of Kenny, another name for Canice. A fine round tower is to be found right next to the cathedral. It can be climbed and commands a great view over Kilkenny – those claustrophobic or suffering from vertigo are encouraged to buy a postcard instead. Kilkenny Castle is well worth a visit when you are passing through Kilkenny is the castle dominating the town. This is a perfect example of an old defensive installation being adapted and converted. Long in disrepair, the restored Kilkenny Castle today is a gem amongst the heritage sites in Ireland. Only it is missing a complete wall, making its defensive properties something of a joke. Smithwick's Brewery is responsible for the fact that Kilkenny's name is known around the globe ... as a type of beer. Here not only the brand "Smithwick's" is brewed, but also the famous "Kilkenny". Which are not identical, despite persistent rumors that "Kilkenny" is just the export name for "Smithwick's", as people could not pronounce it properly. Give it a try... the beer as well as the pronunciation. After a few pints, it'll all be "smiffix" to you. Rothe House in Kilkenny was built between 1594 and 1610 and is a typical merchant's house in the Elizabethan style, complete with two rear yards. Find out all about the town's history here. 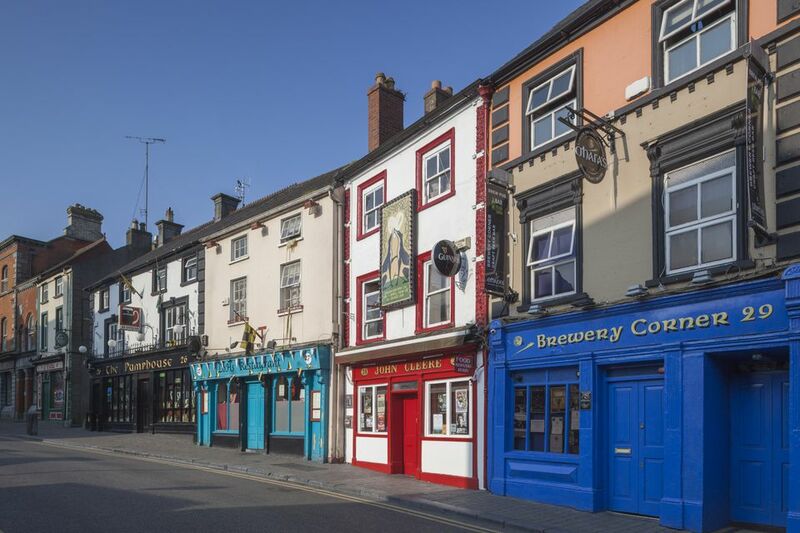 Kyteler's Inn is one of the must-see places in Kilkenny – a good, friendly pub with a satisfying menu in the restaurant area. But current culinary concerns are less a reason then the mysterious history of the actual house. The black cat in the pub sign will give you a clue ... the house was home to Dame Alice Kyteler, a wealthy woman who managed to outlive no less than four wealthy husbands. Somehow suspicion fell upon her and she was accused of witchcraft. The pub is reputedly haunted. But not by Dame Alice, but by her poor servant Petronella. The Black Abbey and Black Freren Gate are named after the "black friars," or the Dominicans, who had a monastery here. Not the most exciting ecclesiastical ruins in County Kilkenny, but a solid piece of medieval Kilkenny and Irish history. Jerpoint Abbey must be a strong contender for the most picturesque abbey ruin in Ireland (the best view is, unfortunately, from the busy road). And it ranks high up the list of places that really needs to be explored in a guided tour. Unless you are fairly familiar with ecclesiastical ruins, you will need some explanations. The guides also point out the best bits, which you otherwise might miss. Founded in 1193 by Augustinians from Cornwall, the impressive remains of Kells Priory spread over no less than five acres, complete with fortifies walls and dwelling towers from the 15th century. But be not confused, this is not the Kells famed for round tower and high crosses (which is Kells in County Meath, at times home to the "Book of Kells"). Visiting County Kilkenny and stuck for something to do in the evening? Well, you could do worse than head out into a local pub (which, by default, will be an "original Irish pub") and then join a traditional Irish session ... so why not give it a try?